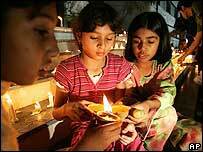 People in South Asia have been marking the first anniversary of a devastating earthquake which killed 75,000 people. Pakistan's President Pervez Musharraf led a wreath-laying ceremony at the time the 7.6-magnitude tremor struck, followed by a minute's silence. The quake's effects are still being felt - most of the 6,000 schools destroyed have not been rebuilt and children are still studying outside. In Islamabad survivors have protested over the alleged theft of relief funds. An overnight vigil was held in the Pakistani capital to remember those who died in the collapse of a 10-storey block of flats in the city, the Margalla Towers. Among those attending the vigil was resident Muhammad Omer, who said he was rescued from the rubble after 26 hours. "We are here to commemorate and console the loved ones of the deceased and pray for the deceased," he said. 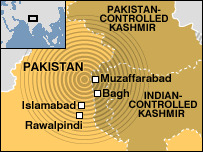 In the city of Muzaffarabad, the capital of Pakistan-administered Kashmir and one of the worst affected areas, Gen Musharraf laid a wreath at a monument constructed to remember the dead at 0852 (0352 GMT) - the same minute the earthquake struck on 8 October 2005. "Today on my way here in my helicopter I kept looking for signs of the destruction that were so prominent before," Mr Musharraf said. "I'm glad to say and congratulate all of you who've helped towards this end that there's no remnant of the devastation." But others are less positive, says the BBC's Barbara Plett in Muzaffarabad. It is true that in many places rubble has been cleared and the routine of normal life has replaced the air of crisis, but reconstruction has not really started, says our correspondent. Most earthquake survivors are living in temporary shelters and some are still in tents. One of them had this message for the president: "Please look and visit our camp and imagine can I live in this? Can our president live in camps in this situation? Can he imagine?" The tremor occurred as the school day was beginning - 18,000 children died in schools alone, yet more were killed at home. One year on, about 400,000 people face a second winter without permanent shelter in the mountains and valleys of northern Pakistan, according to the International Federation of Red Cross and Red Crescent Societies. Pledges of $5.4bn made by the international community - money and supplies - are urgently required. 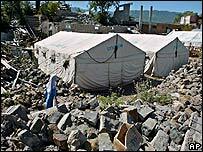 Reconstruction efforts have been tainted by accusations that funds have been misused and that some United Nations relief money was channelled through charities associated with extremist jihadi groups. On Saturday about 1,000 survivors protested in Islamabad, accusing officials of embezzling relief funds. Gen Musharraf has dismissed the criticisms and said that basic facilities will be provided to everyone affected by the quake. He said 80% of reconstruction work would be finished over the next three years.